In Budapest, I found no other way but to pay a visit to the nearest Ikea. I bought what I thought was a very basic kit, but it was still rather heavy and ate into my meagre budget. Eventually the kit expanded – there were birthdays and a Christmas to celebrate, and so non-Ikea cups and dishes found their way to me. When I moved out, I asked the dormitory administration to keep a box of kitchen stuff for a student I knew was coming after me, so she can avoid the Ikea trip. As far as I know, students passed it on after she graduated as well. Next, I lived in a series of apartments with equipped and unequipped kitchens, and sometimes it was impossible to know what I will find. Not all places had an Ikea or something similar nearby, and sometimes cups, plates and other things in corner shops looked impossibly ugly. Ikea tends to be not only overwhelming, but tempting to buy more than you need as well. 1. If you have no cups, get a take-away coffee and keep the cup. These unrecyclable containers are made to withstand heat. Don’t be deceived by the throw-away culture that calls them ‘single-use’. These cups are sturdier than they look. I use those that I was guilty to accumulate in Malta as outdoor flower pots for small plants, with or without hand-painted decorations in acrylic paint. The seams have swollen, but otherwise, rain or shine, no damage at all. If you move at the beginning of the year, take-away cups will most likely still be decorated with cute patterns, and you can continue using them until nice ceramic cups find your way to you. When you make new friends, at least one of them will give you a cup on at least one occasion. 2. Get a spork – a universal camping utensil which doubles as a spoon, a fork and a knife. Use a universal pocket knife as a sharp knife, can and bottle opener, and a screwdriver. If you go to events and presentations, sooner or later someone will give you a bottle opener in their freebies bag. 3. Learn to use chopsticks and if you’ve been to East Asia or an East Asian festival, travel with your favourite pair. 4. If any meal you’ve ordered home comes with disposable cutlery, keep it for guests. If you moved countries recently, they won’t judge you. Also, don’t forget all the craft fairs and flea markets that you will eventually discover and keep some of your kitchen-related shopping for those. 5. Use food packaging instead of tuperware for as long as you can. Also keep the salt, pepper and sugar packs that come with your food. I don’t add sugar to anything, but I keep sugar for guests. 6. 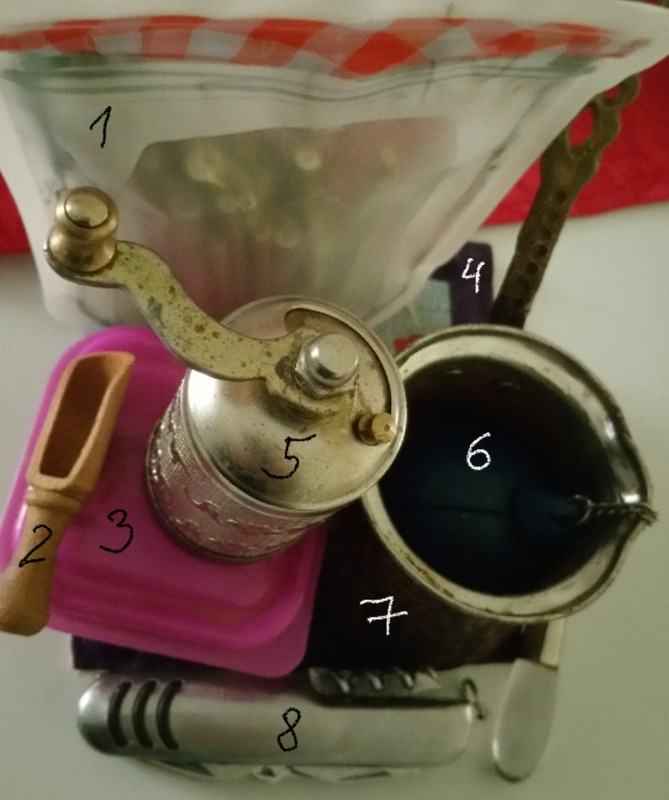 A Turkish coffee pot takes less space than a moka. 7. Pans and pots are tricky. People usually give them away when their surface is scratched, and as much as you believe in circular economy, you don’t want toxic stuff. I guess a good compromise is getting a stewing pot that can double as a pan – and also encourage you to stew more. 8. I tried to do without a grater for a while, but it became too annoying and time-consuming. 9. You might miss having a blender at home. But with all the growing evidence that destroying your food’s fibre is bad for you, think twice if you really need one. 10. Don’t buy all your spices at once. Stick to the essentials, and accumulate the rest slowly. I wasted lots of spices because of my lifestyle. Some, bought during my travels, expired while waiting for me at my parents’. Others had to find a new home, because the container was too large to consume within the time I was staying in the country. Also, there may be surprises in your new country that will influence how you acquire spices. If there are markets with spices by weight, check if you can buy a small amount in your own container. In Malta, I initially bought pepper, cardamom, cloves, cumin seeds and cinnamon. I haven’t finished any of these, although I cook two meals a day at home and always use spices. But had I not learned my lessons in other countries, I would have been tempted to buy more. I soon learned that it’s very easy to go foraging for fennel seeds in Malta, so there is absolutely no reason to buy them. There is also some wild rosemary, which can be dried and stored. I’ve also met families with bay leaves and chilli to share. Dill and oregano grow like weeds in my parents’ garden, so I bring them from my trips to Lithuania. The most surprising thing is that parsley and celery leaves are free in most shops in Malta when you buy other things. So don’t go on a shopping spree for spices until you know what grows in the wild, what is likely to grow in your friends’ gardens, and what you can get for free – and, on top of it, sourced in a more sustainable way. Also, it is very likely that people will give you spices – as a souvenir, as a holiday gift, etc. Like with other things, be flexible about your habits, try out local combinations and wait it out.